On the plus side, I had this lovely recipe for dinner and it helped ease the pain of my baking flop. Actually, the two large glasses of Chocolate Peppermint Soy milk with chocolate mint baileys were probably more helpful in easing the pain but I’m still totally obsessed with this recipe. It’s insanely good. Coat the bottom of a large soup pan with olive oil and heat. Add onions and leeks to the pan with a sprinkle of salt, cooking for 5 minutes. Add in mushrooms and cook for 2-3 minutes more. Stir in garlic, thyme and parsley and cook for 30 seconds. 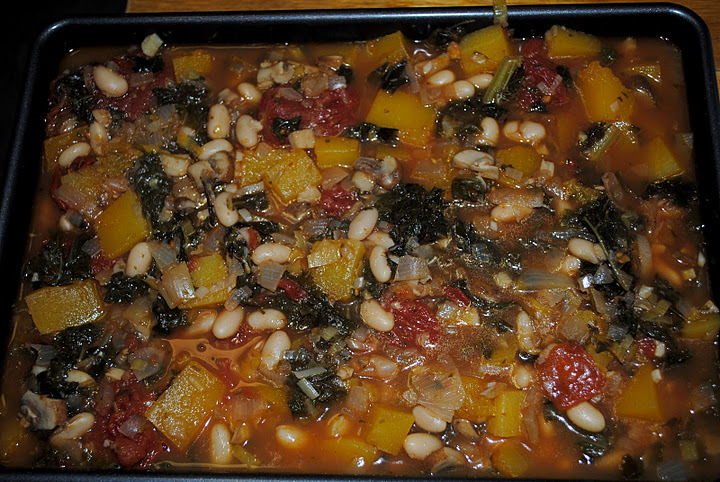 Add spinach, kale, squash, tomatoes, beans, bay leaf and broth. Bring to a boil then reduce to a simmer and cook f0r 20 minutes, covered. 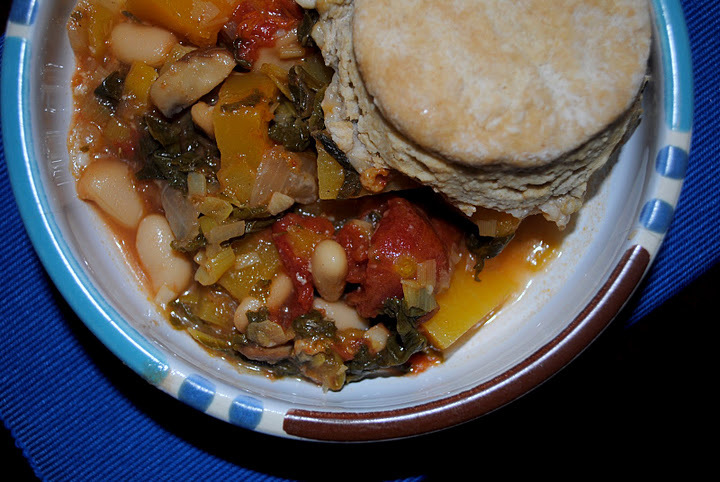 While soup is cooking, make biscuits below and preheat oven to 375 degrees F.
After 20 minutes, transfer to the baking dish. Top with biscuits, then brush each biscuit with melted earth balance. 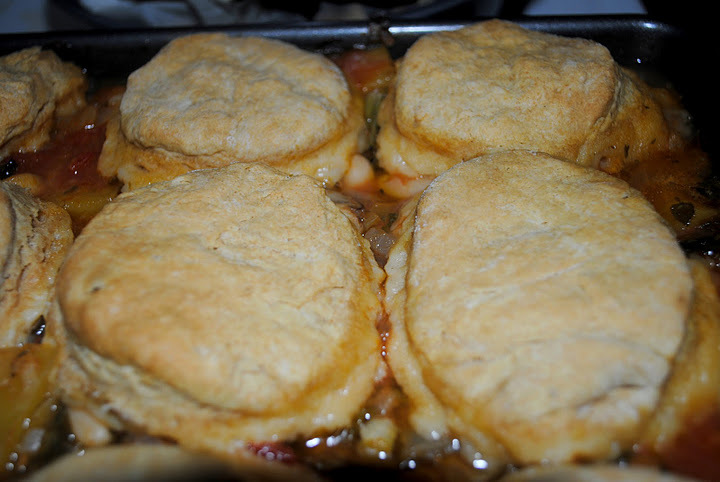 Bake for 40-45 minutes, or until the biscuits are done. Let cool for 10 minutes before serving. 5 tbsp transfat-free vegetable shortening (like Crisco) or very cold vegan “butter” like Earth Balance, chopped into small cubes. With a fork or a pastry-cutter, mix the fat into the flour until you have a coarse mixture with no large pieces of fat. If using “butter,” work quickly because you don’t want the fat to melt. Now add the curdled soymilk-vinegar mixture and mix quickly until the dough comes together. Make a ball of the dough, cover with plastic wrap, and refrigerate for 15-30 minutes. Use a round cookie cutter (I used a round drinking glass) and continue with the steps above. Melinda and I actually used our team work powers to make this meal. She’s crashing at my place for a while. 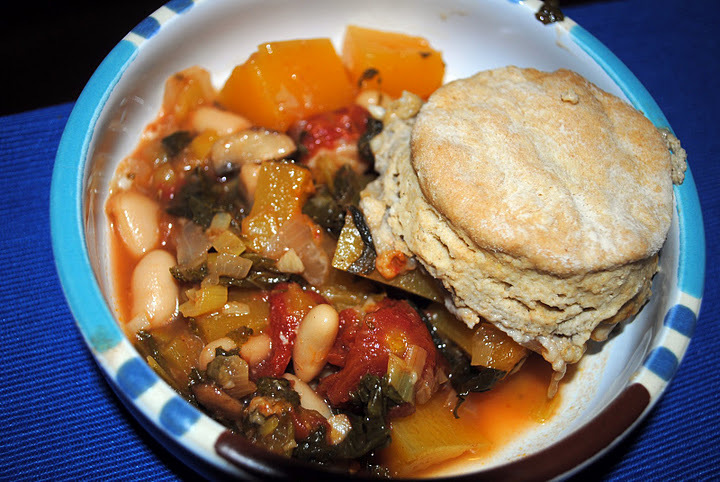 So I bought all the ingredients, Melinda made the soup and biscuit dough, I came home from work and put the soup in the pan and cut out the biscuits and baked it. In fairness, she had the tough part so she gets 2/3 credit for this recipe. It turned out amazing so she totally deserves it. She’s also responsible for getting me addicted to chocolate mint baileys, which she keeps adding to the hot chocolate she offers me when I get home from work. I’m not complaining though! In fact, when I bring boys around I hope she hints to them that like the people on Mad Men, I like to come home with a tumbler of booze waiting for me…except instead of scotch, I expect hot chocolate with mint baileys. But I digress, this soups amazing so go make it.